Self-confessed recovering, cranky Calvinist, Jeff Medders wonders whether the love of God has been replaced with the love of Calvinism. It's one thing having the "five points" all worked out in your head, but have they really penetrated your heart? If you’re not a Calvinist, this book is for you; and if you are a Calvinist, this book is for you. Jeff Medders explains simply, winsomely, and humbly from a Calvinistic perspective what the Bible teaches about five key doctrines. And he demonstrates throughout that no one truly understands the “doctrines of grace” unless they themselves are gracious and humble. 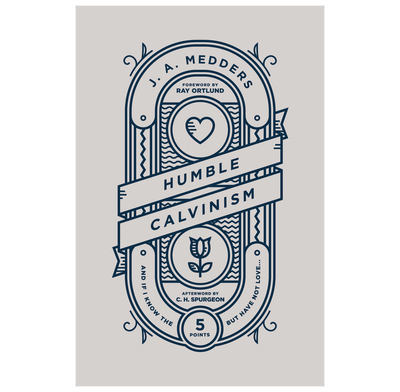 Down-to-earth, often funny, and with a keen knack for illustration, Medders makes plain what biblical Calvinism—Humble Calvinism—looks like in everyday life. Maybe in another generation the term "humble Calvinism" won't seem like such an oxymoron. If so, this encouraging and challenging book will have been used by God to help us live up to what we believe. Reformed culture seems to be known for its harshness and lack of grace. Yet Reformed soteriology should create a joyful heart and a deep, glad humility that overflows into compassionate evangelism and graciousness to all. I hope Jeff's book will be used by God to renew a spirit of gentleness and humility among us, and will encourage those who have rejected these beautiful beliefs to consider them anew.